I took this photo in rather a hurry as we queued to drive onto the cross channel ferry a couple of weeks ago. The owner wasn't there so I couldn't ask exactly what bike it was. 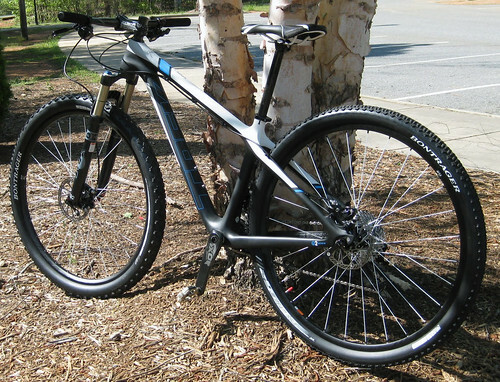 After searching around for "trek carbon monocoque co-molded" (written on the frame) I think it's a Trek Superfly Elite carbon framed mountain bike. But this one is obviously used as a road bike. 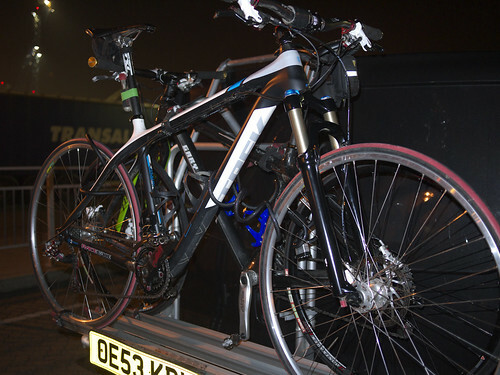 I thought it looked a gorgeous machine – the 'ultimate' bicycle I'd buy with my Euromillions (I won £20 a few weeks ago). WARNING-WARNING–DO NOT BUY this bike or anything carbon ... Originally, I bought an '08 Superfly which cracked on the upper seat stay just several weeks after purchase. They replaced with '09 frame.Rode for several months and that frame came apart on back of top tube.NO IMPACT! !Had to take bike to a Trek Dealer. Trek Corp said NO to warranty with NO EXPLANATION of why!Trek dealer was sympathetic said it was failure from inside out. If your superfly starts creaking–it's your frame starting to come apart! My frame cracked under the seat post after 544 miles of medium hard use and no crashes. It got so loud it was embarassing to ride. The dealer replaced it with no problem, but the new frame is no better. I am continually lubricating and tightening and loctiting every damn bearing I can find. I am so depressed. GF and Trek know they have a problem too... I know one guy that is on his third frame and I am taking mine back tomorrow. Gary Fisher hits the spot in this race bike. No problems with the warranty after a cracked frame. I have had all the problems mentioned here cracked the frame GF replaced great customer service. How much credence to be given to online comments by 'users'. No verification, just opinion from anonymous people with no reputation to consider (Trek don't respond as you'd think they might if they had any concerns over what is being alleged). Whether Willow Koerber's carbon frame is exactly the same quality as the one you'd buy in the shops. Presumably Trek don't want the publicity of a broken frame mid-race but a retail buyer paying that price will want a frame that lasts longer than just one day – many years probably. Carbon fibre for retail bicycle components... used for building critical parts in aircraft and racing cars as well as bikes. Trek and Gary Fisher are some of the great names in bicycles. Do they really sell suspect bike frames? The bike in my photo has been converted from 29-er MTB to road. The frame is built for road size wheels so it's just a matter of swapping them over – pity it's not a simple thing to fit road mudguards on the suspension fork. I like the formula: disc brakes, suspension fork and straight bars on a performance road bike (apart from the mudguard problem). It should be a tough frame, easily strong enough for road cycling. I'm not sure if it's my 'ultimate bike' but as I'm still waiting for a big win on the lottery it's academic. Posted by Patrick on October 15th, 2011. It would surprise me if carbon bikes aren't getting better, year on year, as the manufacturer's experience grows. Carbon bikes from '08 are from the 'early' years of the technology. Willow looks sooooo clean on her mtb! How does she do this? I have a standard mudguard fitted on my front suspension fork. I just had to jiggle the fastenings for the stays a little. One fastens around a longer bolt that replaced the original one that held the disc brake assembly in place. The other fits around a nylon band that is actually a Cateye light clamp. There is sure to be a tidier solution, but it does the job. I'm finding carbon as a bike frame option less attractive just lately. I know what you mean Chris (about carbon frames) but I think Stephen Almond is probably right that they are much improved from 2008, especially from Trek with the lifetime guarantee. I would not want a carbon fork but if money was no object I'd buy a Superfly Elite tomorrow (£4,000). It has a gorgeous frame. I've converted several mountain bikes to road use, for touring. I firstly fit slick tyres, Specialized Fatboys are my favourites, I get a higher closer handlebar position and of late, fit bullhorn bars. They make fab touring bikes then, but with original setup are too low and too stretched. The brakes and gearing are ideal for touring. You can usually bodge a carrier onto them (I refuse to say rack) and with a bit of ingenuity, mudguards. Trek bikes are awesome, but I'd agree with you about having problems with their mud guard. Then again, that does not stop me from going on a ride. In fact, my Morpheus CONSPIRACY Standard Build also don't have one. I don't have an actual photo of my ride, but you can see it here: https://www.morpheusbikes.com/product-page/kopie-von-conspiracy-standard-build. Although mud is something I have to expect whenever I go out for a ride, washing off the dirt in my clothes is just another problem when I arrive home. Nevertheless, cycling is still my favorite!